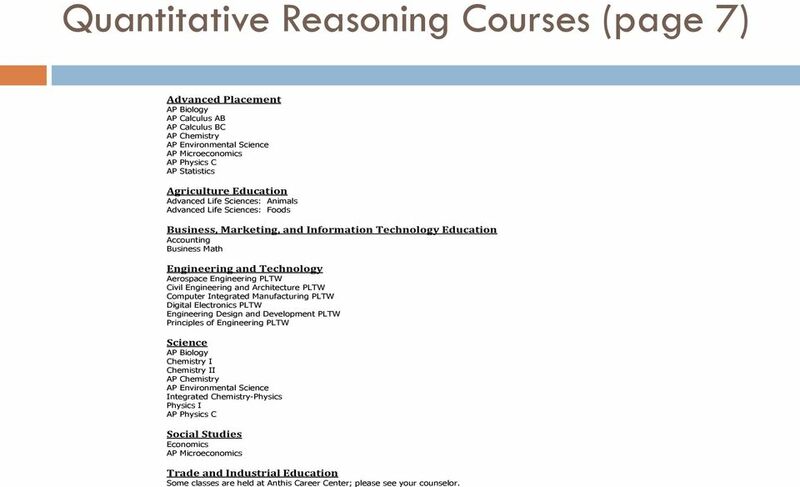 4 Quantitative Reasoning Courses (page 7) Advanced Placement AP Biology AP Calculus AB AP Calculus BC AP Chemistry AP Environmental Science AP Microeconomics AP Physics C AP Statistics Agriculture Education Advanced Life Sciences: Animals Advanced Life Sciences: Foods Business, Marketing, and Information Technology Education Accounting Business Math Engineering and Technology Aerospace Engineering PLTW Civil Engineering and Architecture PLTW Computer Integrated Manufacturing PLTW Digital Electronics PLTW Engineering Design and Development PLTW Principles of Engineering PLTW Science AP Biology Chemistry I Chemistry II AP Chemistry AP Environmental Science Integrated Chemistry-Physics Physics I AP Physics C Social Studies Economics AP Microeconomics Trade and Industrial Education Some classes are held at Anthis Career Center; please see your counselor. 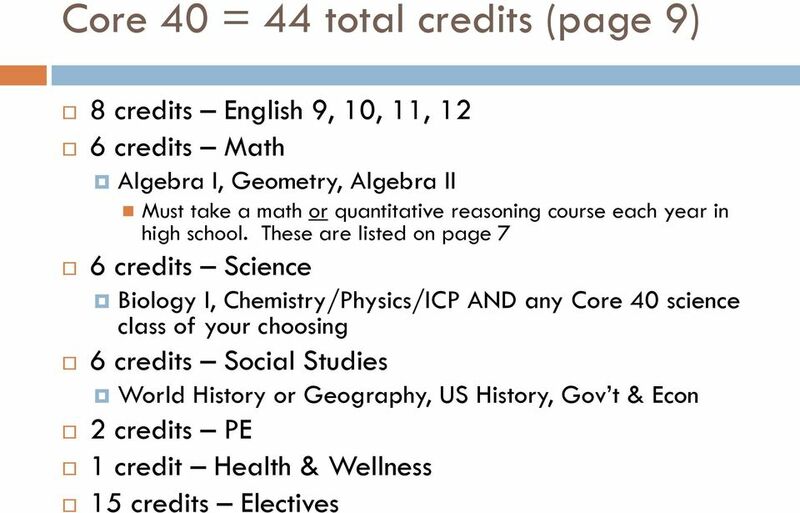 6 Technical Honors = 47 credits (page 9) All Core 40 requirements, plus See Mrs. Gerber for additional requirements if you are interested in earning this diploma but along with these you also must have semester grades of a C- or higher and a cumulative GPA of 7.0 or higher at end of senior year. 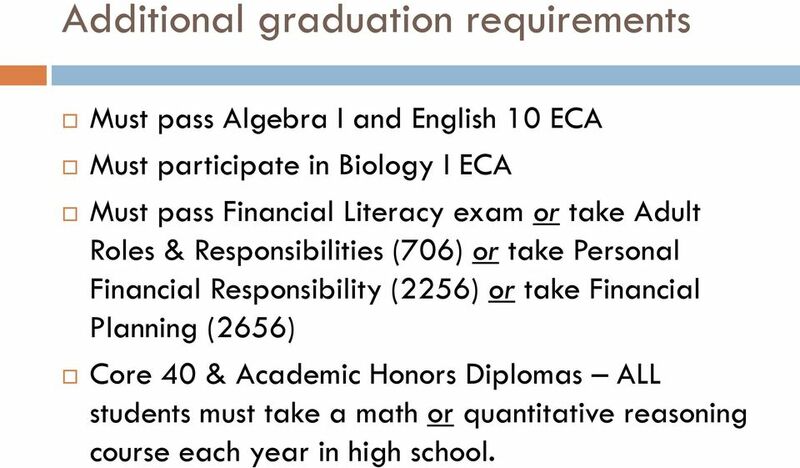 7 Additional graduation requirements Must pass Algebra I and English 10 ECA Must participate in Biology I ECA Must pass Financial Literacy exam or take Adult Roles & Responsibilities (706) or take Personal Financial Responsibility (2256) or take Financial Planning (2656) Core 40 & Academic Honors Diplomas ALL students must take a math or quantitative reasoning course each year in high school. 8 Course Selection Sheet Fill out information at the top of the sheet VERY important to check diploma type! All prerequisites are marked with an asterisk *. 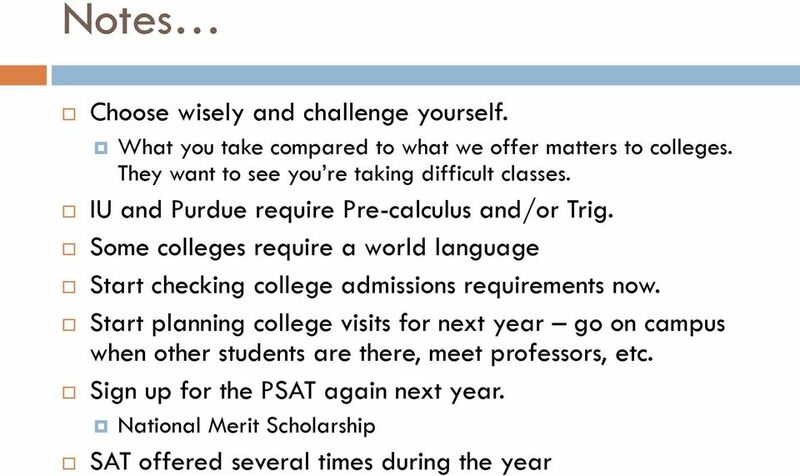 Make sure you meet ALL prerequisites! Teacher recommendations get signatures! 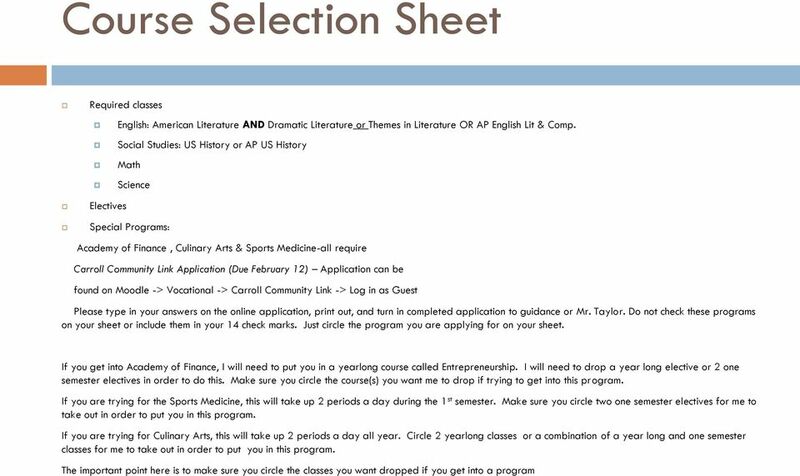 11 Course Selection Sheet Need 14 check marks on your sheet, EVEN if you are applying for Anthis, AOF, Culinary, or Sports Medicine If you are hoping to get into one of these programs, please circle which classes you would want to DROP if you get into one of those programs. If you are planning on taking a course online, you still need to select that course on your sheet & online until you bring me a copy of your online class registration then I will drop the class from your schedule See me if you are planning on doing this. Registration deadline for an online class is March 24. 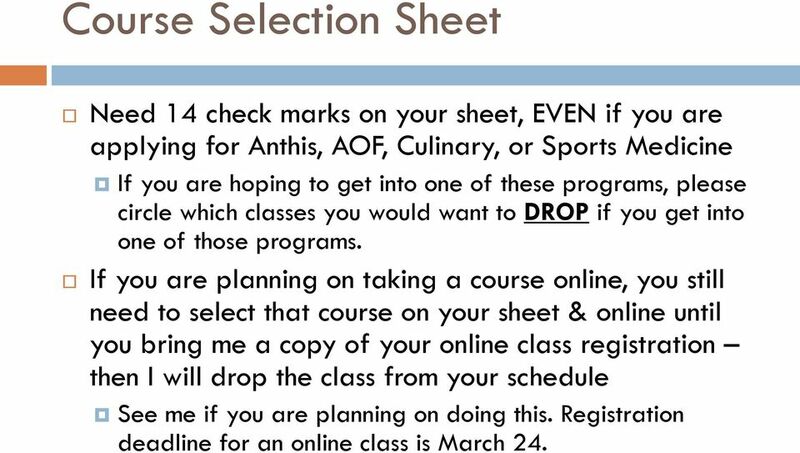 12 Course Selection Sheet If you failed a class or need to repeat a class for a better grade, make sure you select that class on your paper and online. Choose alternates on your course selection form ONLY do not need to choose alternates online! Do not choose alternates that you already picked as electives or have already taken in the past! Don t forget to complete everything on the back! 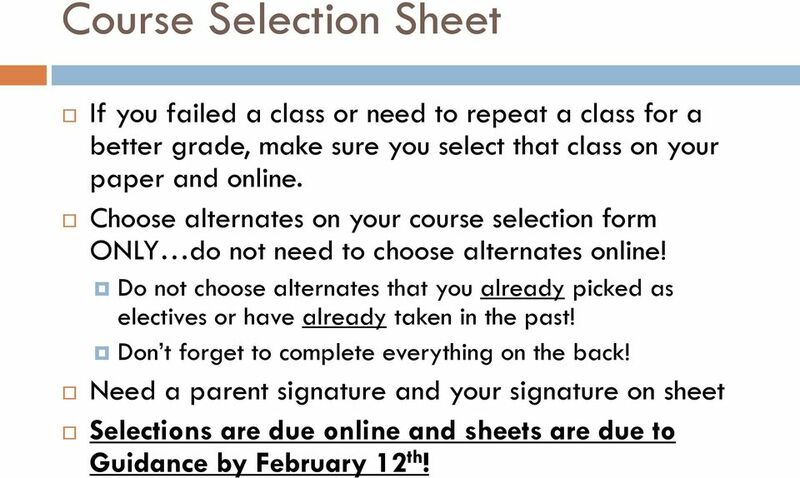 Need a parent signature and your signature on sheet Selections are due online and sheets are due to Guidance by February 12 th! 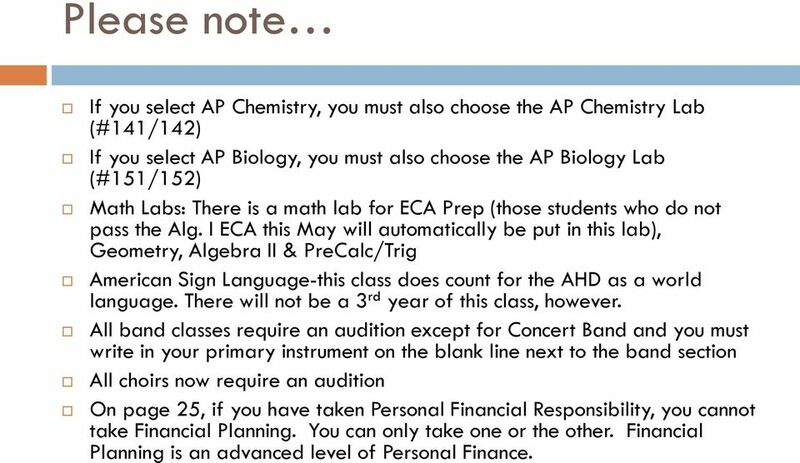 13 Please note If you select AP Chemistry, you must also choose the AP Chemistry Lab (#141/142) If you select AP Biology, you must also choose the AP Biology Lab (#151/152) Math Labs: There is a math lab for ECA Prep (those students who do not pass the Alg. I ECA this May will automatically be put in this lab), Geometry, Algebra II & PreCalc/Trig American Sign Language-this class does count for the AHD as a world language. There will not be a 3 rd year of this class, however. All band classes require an audition except for Concert Band and you must write in your primary instrument on the blank line next to the band section All choirs now require an audition On page 25, if you have taken Personal Financial Responsibility, you cannot take Financial Planning. You can only take one or the other. Financial Planning is an advanced level of Personal Finance. 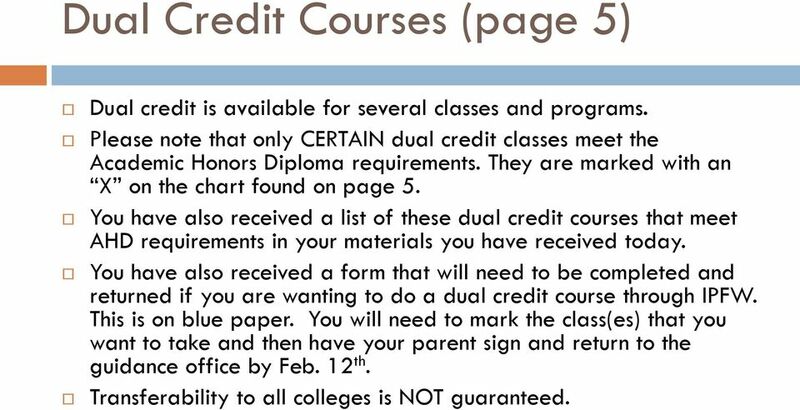 14 Dual Credit Courses (page 5) Dual credit is available for several classes and programs. 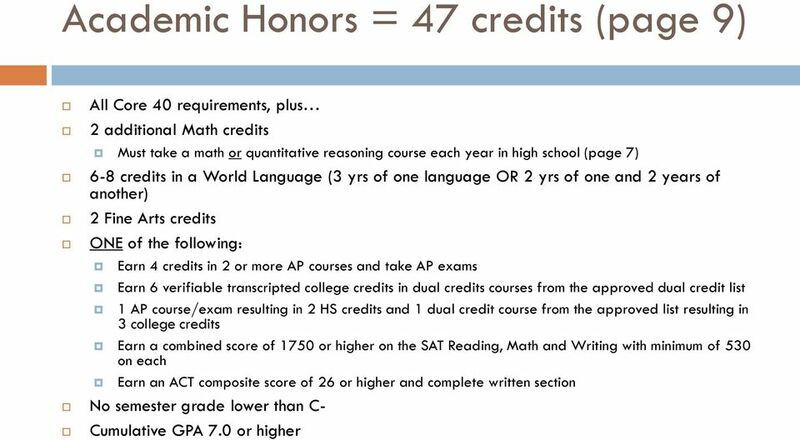 Please note that only CERTAIN dual credit classes meet the Academic Honors Diploma requirements. They are marked with an X on the chart found on page 5. 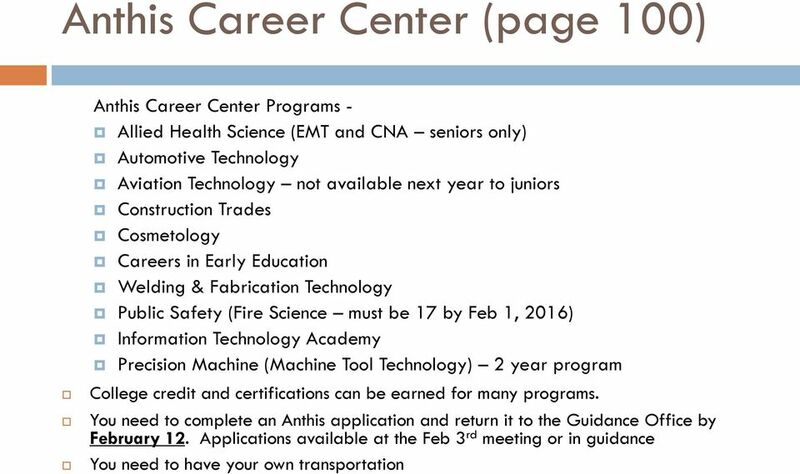 You have also received a list of these dual credit courses that meet AHD requirements in your materials you have received today. 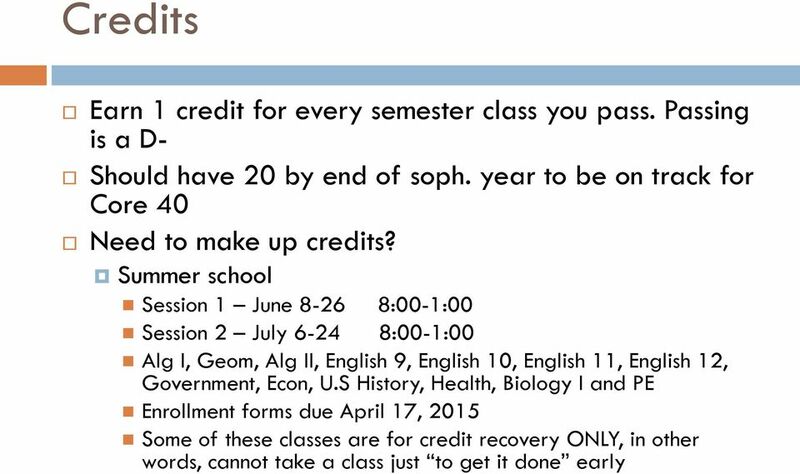 You have also received a form that will need to be completed and returned if you are wanting to do a dual credit course through IPFW. This is on blue paper. You will need to mark the class(es) that you want to take and then have your parent sign and return to the guidance office by Feb. 12 th. Transferability to all colleges is NOT guaranteed. 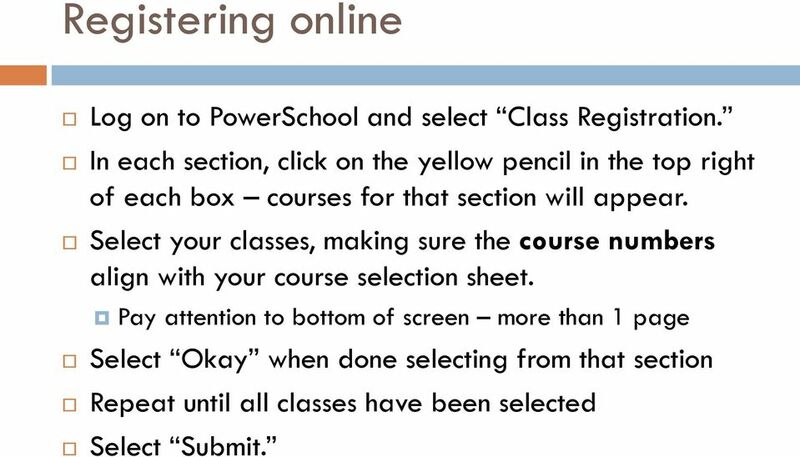 15 Registering online Log on to PowerSchool and select Class Registration. In each section, click on the yellow pencil in the top right of each box courses for that section will appear. Select your classes, making sure the course numbers align with your course selection sheet. Pay attention to bottom of screen more than 1 page Select Okay when done selecting from that section Repeat until all classes have been selected Select Submit. 17 Questions? Available before and after school in the Commons. If you are in a study hall, your teacher can write you a pass to come see me during the day. Please do not sign up on a blue counselor pass to see me in regards to scheduling. Just come during your study hall, or, before/after school. 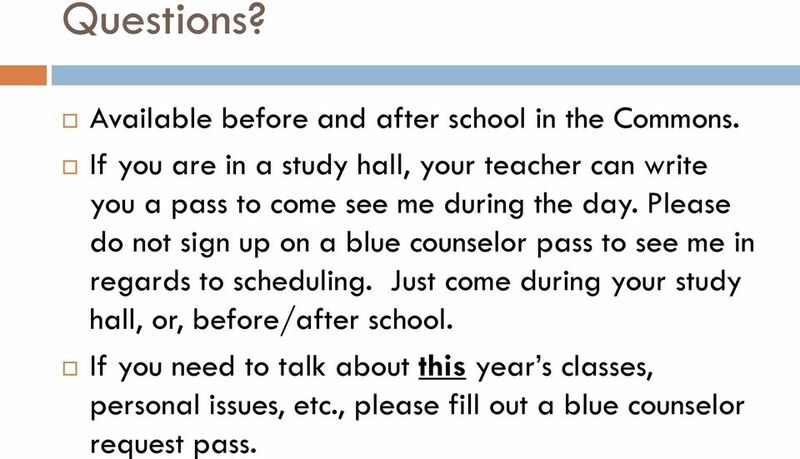 If you need to talk about this year s classes, personal issues, etc., please fill out a blue counselor request pass.